Rugby Town dropped two places over the past week, meaning they slipped out of the Southern League Central Division play-off zone for the first time in nearly three months. However it is still desperately tight at the top of the table with all the main contenders for promotion facing just six more games. Whilst play-off rivals Valley and Barton Rovers were playing out an entertaining goalless draw at Butlin Road at the weekend, an in-form Royston recorded a fifth straight victory to ease above Town by two points into fourth. Rovers then went on to secure a 2-0 midweek win over St.Ives in their game in hand over Rugby, leapfrogging them on goal difference in the process. Next-up for Dave Stringer’s men is a trip to bottom club North Greenford, whilst Royston travel to Beaconsfield and Barton host current second placed side Aylesbury. Rovers appear to have the toughest run in on paper, with games against Royston, runaway leaders Kettering and seventh placed Hanwell to follow this weekend’s tough test, although Rugby must also host Royston and Kettering before the regular season closes. Town’s hosts this weekend are currently bottom of the division with just 23 points, two behind AFC Hayes – who Valley are also due to visit in a fortnight’s time. Greenford go into the game on the back of a surprise midweek win over Hanwell though, a result which may have ended the play-off hopes of the Middlesex side – who are now eight points adrift of Rugby. Valley’s head-to-head record with the Blues has been good over the past five years, with seven victories and a draw in the nine games between the two clubs. The only blemish for Town came at a similar stage of the 2011/12 season, when a once more play-off chasing Rugby suffered a particularly disappointing 4-0 thrashing at Berkeley Fields. Town ultimately finished just outside the zone that season in sixth, and Stringer will of course be hoping that history does not repeat itself this time round against a side whose form of late has shown a marked improvement. Their Tuesday victory over Hanwell meant it was just two defeats in seven outings in March for them, although that came on the back of a woeful February which saw four straight defeats – conceding 18 times and scoring none in the process. Valley’s March return has seen them win just once in four attempts, after a particular successful January and February where they took 24 points from the 27 available. Town will be without unavailable midfielder Sam Youngs for Saturday’s trip, which may hand a first league start for Fazel Koriya – with the wide man having made eight appearances from the bench since he re-signed for the club in January. 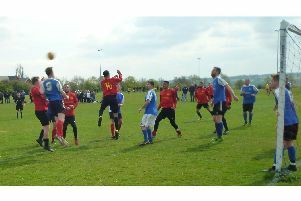 Stringer may also look to return striker Richard Gregory to his opening eleven, after he was only utilised as a substitute against Barton due to an injury picked up the previous week, with skipper Alex Gudger and keeper Richard Morris the other two hoping to recover from their injuries ahead of the game. # The club coach to North Greenford will leave Butlin Road at 11.00 a.m. For latest information on this, contact Tony Mann on 07970 691366.